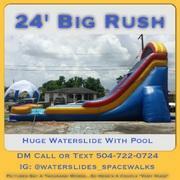 This 24 Feet High Waterslide has the height and gives you the biggest rush when sliding. Bigger the slide....bigger the rush equals some of the biggest smiles. If youre seeking a rush well here you have it.